"Saud" redirects here. For the King, see Saud of Saudi Arabia. For the eponymous ancestor, see Saud ibn Muhammad ibn Muqrin. For other uses, see Saud (disambiguation). 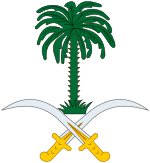 The House of Saud (Arabic: آلسعود‎, translit. ʾĀl Suʿūd IPA: [ʔaːl sʊʕuːd]) is the ruling royal family of Saudi Arabia. It is composed of the descendants of Muhammad bin Saud, founder of the Emirate of Diriyah, known as the First Saudi state (1744–1818), and his brothers, though the ruling faction of the family is primarily led by the descendants of Ibn Saud, the modern founder of Saudi Arabia. The most influential position of the royal family is the King of Saudi Arabia. King Salman, who reigns currently, chose first his nephew and then his son as the crown prince without consulting the Allegiance Council. The family is estimated to comprise 15,000 members, but the majority of the power and wealth is possessed by a group of about 2,000 of them. House of Saud is a translation of Al Saud, an Arabic dynastic name formed by adding the word Al (meaning "family of" or "House of") to the personal name of an ancestor. In the case of the Al Saud, the ancestor is Saud ibn Muhammad ibn Muqrin, the father of the dynasty's 18th century founder Muhammad bin Saud (Muhammad, son of Saud). Today, the surname "Al Saud" is carried by any descendant of Muhammad bin Saud or his three brothers Farhan, Thunayyan, and Mishari. Al Saud's other family branches like Saud al-Kabir, the Al Jiluwi, the Al Thunayan, the Al Mishari and the Al Farhan are called cadet branches. Members of the cadet branches hold high and influential positions in government though they are not in the line of succession to the Saudi throne. Many cadet members intermarry within the Al Saud to reestablish their lineage and continue to wield influence in the government. All members of the royal family have the title of Emir (Prince) but sons, daughters, patrilineal granddaughters and grandsons of Ibn Saud are referred to by the style "His Royal Highness" (HRH), differing from those belonging to the cadet branches who are called "His Highness" (HH), while the reigning king has the additional title of Custodian of the Two Holy Mosques. The Mrudah became rulers of al-Diriyah, which prospered along the banks of Wadi Hanifa and became an important Najdi settlement. As the clan grew larger, power struggles ensued, with one branch leaving for nearby Dhruma, while another branch (the "Al Watban") left for the town of az-Zubayr in southern Iraq. The Al Muqrin became the ruling family among the Mrudah in Diriyah. The name of the clan comes from Sheikh Saud ibn Muhammad ibn Muqrin who died in 1725. The First Saudi State was founded in 1744. This period was marked by conquest of neighboring areas and by religious zeal. At its height, the First Saudi State included most of the territory of modern-day Saudi Arabia, and raids by Al Saud's allies and followers reached into Yemen, Oman, Syria, and Iraq. Islamic Scholars, particularly Muhammad ibn Abdul Wahhab and his descendants, are believed to have played a significant role in Saudi rule during this period. The Saudis and their allies referred to themselves during this period as the Muwahhidun or Ahl al-Tawhid ("the monotheists"). Later they were referred to as the Wahhabis, a group of particularly strict, puritanical Sunni sect, named for its founder. After his defeat at Mulayda, Abdul-Rahman ibn Faisal went with his family into exile in the deserts of eastern Arabia among the Al Murra bedouin. Soon afterward, however, he found refuge in Kuwait as a guest of the Kuwaiti emir, Mubarak Al Sabah. In 1902, Abdul-Rahman's son, Abdul Aziz, took on the task of restoring Saudi rule in Riyadh. Supported by a few dozen followers and accompanied by some of his brothers and relatives, Abdul Aziz was able to capture Riyadh's Masmak fort and kill the governor appointed there by Ibn Rashid. Abdul Aziz, reported to have been barely 20 at the time, was immediately proclaimed ruler in Riyadh. As the new leader of the House of Saud, Abdul Aziz became commonly known from that time onward as "Ibn Saud" in Western sources, though he is still called "Abdul Aziz" in the Arab world. Ibn Saud spent the next three decades trying to re-establish his family's rule over central Arabia, starting with his native Najd. His chief rivals were the Al Rashid clan in Ha'il, the Sharifs of Mecca in the Hijaz, and the Ottoman Turks in al-Hasa. Ibn Saud also had to contend, however, with the descendants of his late uncle Saud ibn Faisal (later known as the "Saud al-Kabir" branch of the family), who posed as the rightful heirs to the throne. Though for a time acknowledging the sovereignty of the Ottoman Sultans and even taking the title of pasha, Ibn Saud allied himself to the British, in opposition to the Ottoman-backed Al Rashid. From 1915 to 1927, Ibn Saud's dominions were a protectorate of the British Empire, pursuant to the 1915 Treaty of Darin. Ibn Saud won final victory over the Rashidis in 1921, making him the ruler of most of central Arabia. He consolidated his dominions as the Sultanate of Nejd. He then turned his attention to the Hijaz, finally conquering it in 1926, just months before the British protectorate ended. For the next five and a half years, he administered the two parts of his dual realm, the Kingdom of Hejaz and Nejd, as separate units. By 1932, Ibn Saud had disposed of all his main rivals and consolidated his rule over much of the Arabian Peninsula. He united his dominions into the Kingdom of Saudi Arabia that year. Ibn Saud's father, Abdul Rahman retained the honorary title of "imam." In 1937 near Dammam, American surveyors discovered what later proved to be Saudi Arabia's vast oil reserves. Before the discovery of oil, many family members were destitute. Ibn Saud sired dozens of children by his many wives. He had at most four wives at a time, divorcing many times. He made sure to marry into many of the noble clans and tribes within his territory, including the chiefs of the Bani Khalid, Ajman, and Shammar tribes, as well as the Al ash-Sheikh (descendants of Muhammad ibn Abd al-Wahhab). He also arranged for his sons and relatives to enter into similar marriages. He appointed his eldest surviving son, Saud as heir apparent, to be succeeded by the next eldest son, Faisal. The Saudi family became known as the "royal family," and each member, male and female, was accorded the title amir ("prince") or amira ("princess"), respectively. Upon Ibn Saud's death, his son Saud assumed the throne without incident, but his lavish spending led to a power struggle with his brother, Crown Prince Faisal. In 1964, the royal family forced Saud to abdicate in favor of Faisal, aided by an edict from the country's grand mufti. During this period, some of Ibn Saud's younger sons, led by Talal ibn Abdul Aziz, defected to Egypt, calling themselves the "Free Princes" and calling for liberalization and reform, but were later induced to return by Faisal. They were fully pardoned but were also barred from any future positions in government. A stroke in 1995 left Fahd largely incapacitated. His half-brother, Crown Prince Abdullah, gradually took over most of the king's responsibilities until Fahd's death in August 2005. Abdullah was proclaimed king on the day of Fahd's death and promptly appointed his younger brother, Sultan bin Abdulaziz, the minister of defense and Fahd's "Second Deputy Prime Minister," as the new heir apparent. On 27 March 2009, Abdullah appointed Prince Nayef Interior Minister as his "second deputy prime minister" and Crown Prince on 27 October. Sultan died in October 2011 while Nayef died in Geneva, Switzerland on 15 June 2012. On 23 January 2015, Abdullah died after a prolonged illness, and his half-brother, Crown Prince Salman bin Abdulaziz Al Saud, was declared the new King. Long-term political and government appointments have occurred, such as those of King Faisal, who was Foreign Minister almost continuously from 1932 to 1975, King Abdullah, who was Commander of the National Guard from 1963 to 2010, and former Crown prince Sultan bin Abdulaziz, who was Minister of Defence and Aviation from 1962 until his death in 2011. Such terms of service have enabled senior princes to mingle their personal wealth with that of their respective domains. They have often appointed their own sons to senior positions within their own fiefdom. Examples of these include Prince Mutaib bin Abdullah as assistant commander in the National Guard until 2010; Prince Khalid bin Sultan as assistant minister of defence until 2013; Prince Mansour bin Mutaib as assistant minister for Municipal and Rural Affairs until he replaced his father in 2009; and Prince Mohammed bin Nayef as assistant minister in the Interior Ministry. In cases, where portfolios have notably substantial budgets, appointments of younger, often full, brothers have been necessary, as deputies or vice ministers, ostensibly to share the wealth and the burdens of responsibility, of each fiefdom. Examples of these include Prince Abdul Rahman who was vice minister of defence and aviation under Prince Sultan; Prince Badr, deputy to King Abdullah in the National Guard; Prince Sattam, who was Deputy Riyadh Governor during King Salman's term; and Prince Ahmed, who held the deputy minister's portfolio under Prince Nayef's interior ministry. Succession has been from brother-to-brother since the death of the founder of modern Saudi Arabia. Ibn Saud was succeeded by his son Saud. Saud was succeeded by his brother Faisal. Faisal was succeeded by his brother Khalid who, in turn, was succeeded by his brother Fahd. Fahd was succeeded by his brother Abdullah, and Abdullah by his brother Salman, the current King. Salman appointed his half-brother Muqrin as Crown Prince in January 2015 and removed him in April 2015. Even Abdulaziz's youngest son was to turn 70 in 2015. Abdulaziz, in 1920, had said that the further succession would be from brother-to-brother, not from father-to-son. King Salman ended the brother-to-brother succession and appointed his 56-year-old nephew Muhammad bin Nayef as Crown Prince in April 2015, thus making the next succession from uncle-to-nephew. At the same time, King Salman appointed his son, Mohammad bin Salman, as Deputy Crown Prince, thus making the following succession from cousin-to-cousin, as Mohammad bin Salman is the cousin of Crown Prince Muhammad bin Nayef. However, in June 2017, Salman elevated Mohammad bin Salman to Crown Prince, following his decision to depose Muhammad bin Nayef of all positions, making his son heir apparent to the throne, and making the next succession father-to-son, for the first time since 1953, when Saud bin Abdulaziz Al Saud succeeded his father, the founder of Saudi Arabia, Ibn Saud. Amid international outcry over the killing of Jamal Khashoggi, members of Saudi's royal families are distressed over the Crown Prince Mohammad bin Salman becoming the next king. A lot of princes and members of the Al Saud family want Prince Ahmed to become the next king instead of MbS. During his London tour, Prince Ahmed criticized the Saudi leadership. He was also the only member of the ruling family to oppose MbS from becoming the crown prince in 2017. In June 2015 Forbes listed Prince Al-Waleed bin Talal as the 34th-richest man in the world, with an estimated net worth of US$28 billion. Prince Al-Waleed had a net worth of $20.4 billion in 2014. King Salman had a net worth estimated at US$17 billion in 2016. The net worth of the entire royal family has been estimated at well over $1.4 trillion which makes them one of the wealthiest families in the world if not the wealthiest. Many princes and government officials have been arrested in the 2017 in alleged anti corruption campaign by the King and Crown prince. United States President Donald Trump has expressed support for the arrests. Due to its authoritarian and quasi-theocratic rule, the House of Saud has attracted much criticism during its rule of Saudi Arabia. There have been numerous incidents, including the Wahhabi Ikhwan militia uprising during the reign of Ibn Saud. Osama Bin Laden, a critic of the US, was a critic of Saudi Arabia and was denaturalized in the mid 1990s. On 20 November 1979, the Grand Mosque seizure saw the al-Masjid al-Haram in Mecca violently seized by a group of 500 heavily armed and provisioned Saudi dissidents led by Juhayman al-Otaybi and Abdullah al-Qahtani, consisting mostly of members of the former Ikhwan militia of Otaibah but also of other peninsular Arabs and a few Egyptians enrolled in Islamic studies at the Islamic University of Madinah. The Saudi royal family turned to the Ulema who duly issued a fatwa permitting the storming of the holy sanctuary by Saudi forces, aided by French and Pakistani special ops units. According to Lawrence Wright, the GIGN commandos did convert to Islam. Most of those responsible, including Al-Otaybi himself, were beheaded publicly in four cities of Saudi Arabia. Since May 2017 in response to protests against the government[disputed – discuss], the predominantly Shia town of Al-Awamiyah has been put under full siege by the Saudi military. Residents are not allowed to enter or leave, and military indiscriminately shells the neighborhoods with airstrikes, mortar and artillery fire along with snipers shooting residents. Dozens of Shia civilians were killed, including a three year old and a two-year-old child. The Saudi government claims it is fighting terrorists in al-Awamiyah. Crown Prince Mohammed bin Salman kept his own mother away from his father for more than two years, out of the fear that she would stop the king from giving the power to him. Princess Fahda bint Falah Al Hathleen, third wife of King Salman was said to be in the US for medical treatment. However, according to the US intelligence she was not in the country. Muqrin bin Abdulaziz Al Saud (born 1945) – Director general of the General Intelligence Directorate from 2005 to 2012; former governor of Ha'il and Madinah provinces. He was appointed second deputy prime minister on 1 February 2013 and he was made crown prince on 23 January 2015 when his half-brother Salman became king. On 28 April 2015 Muqrin was granted resignation based on his request to start the next generation of the royals. ^ "The House of Al Saud – A View of the Modern Saudi Dynasty". 18 September 2015. ^ "HRH Princess Basma bint Saud bin Abdulaziz Al Saud". BBC. 28 July 2011. Retrieved 7 April 2013. ^ Milmo Cahal (3 January 2012). "The Acton princess leading the fight for Saudi freedom". The Independent. Retrieved 3 January 2012. ^ a b CNN, Nicole Chavez, Tamara Qiblawi and James Griffiths. "Saudi Arabia's king replaces nephew with son as heir to throne". CNN. ^ a b Raghavan, Sudarsan; Fahim, Kareem (21 June 2017). "Saudi king names son as new crown prince, upending the royal succession line". The Washington Post. Retrieved 21 June 2017. ^ a b "Saudi royal decrees announcing Prince Mohammed BinSalman as the new crown prince". TheNational. Abu Dhabi Media. Retrieved 21 June 2017. ^ Meet the world’s other 25 royal families The Washington Post. 22 July 2013. ^ Wynbrandt, James; Gerges Fawaz A. (2010). A Brief History of Saudi Arabia. p. xvii. ISBN 978-0-8160-7876-9. ^ a b Stig Stenslie (21 August 2012). Regime Stability in Saudi Arabia: The Challenge of Succession. Routledge. p. 53. ISBN 978-1-136-51157-8. ^ "History of the Kingdom". Ministry of Foreign Affairs. Retrieved 20 March 2015. ^ "Al Saud Family Saudi Arabia History". Arab Royal Family. Retrieved 20 March 2015. ^ G. Rentz (2007). "al- Diriyya (or al-Dariyya)". In P. Bearman; Th. Bianquis; C.E. Bosworth; E. van Donzel; W.P. Heinrichs (eds.). Encyclopaedia of Islam. Brill. Retrieved 8 September 2007. ^ H. St. John Philby (1955). Saudi Arabia. London: Ernest Benn. p. 8. ^ John Pike. "King Abdul Aziz Bin Abdul Rahman Al-Saud". Global Security. Retrieved 20 March 2015. ^ a b c Mark Weston (2008). Prophets and princes: Saudi Arabia from Muhammad to the present. Hoboken, N.J.: Wiley. p. 101. ISBN 0470182571. ^ Wayne H. Bowen (2008). The history of Saudi Arabia (1. publ. ed.). Westport, Conn.: Greenwood Press. p. 73. ISBN 0313340129. ^ Abdullah Mohammad Sindi (16 January 2004). "Britain and the Rise of Islam and the House of Saud". Kana'an Bulletin. IV (361): 7–8. ^ "Saudi Arabia names Prince Nayef as heir to throne". BBC. 27 October 2011. Retrieved 28 October 2011. ^ "After Khashoggi murder, some Saudi royals turn against crown prince". CNBC. Retrieved 20 November 2018. ^ "The World's Billionaires". Forbes. Retrieved 2 July 2015. ^ "Meet The Richest People In The Middle East". Forbes. 24 March 2014. ^ "Saudi King, UAE President at the Center of the Panama Papers". TeleSUR. 4 April 2016. ^ "Royal Wealth – House of Saud". ^ "Saudi princes, ministers and tycoons arrested in sweeping purge". ^ "From Millionaire's Son To Most-Wanted". ^ J.A. Kechichican (1990). "Islamic Revivalism and Change in Saudi Arabia: Juhayman al-'Utaybi's 'Letters to the Saudi People'". The Muslim World. 50: 1–16. ^ Joseph Kostiner (8 July 1997). "State, Islam and Opposition in Saudi Arabia: The Post Desert-Storm Phase". The Middle East Review of International Affairs (MERIA). 1 (2). Retrieved 9 November 2012. ^ Yaroslav Trofimov (22 September 2007). "Did 'Siege of Mecca' Give Birth to Al-Qaida?" (Interview). Interviewed by Jacki Lyden. NPR (National Public Radio). ^ Wright Lawrence (2006). The Looming Tower: Al-Qaeda and the Road to 9/11 (1st ed.). Alfred A. Knopf (US). p. 110. ISBN 978-0141029351. Retrieved 25 January 2014. ^ "Mecca". Global Security. 9 July 2011. Retrieved 29 December 2006. ^ "'You might get shot any time': Saudi forces raid Shia town as Riyadh welcomes Trump". RT. ^ "Saudi Shia-Muslim town under 'siege' for sixth day". 15 May 2017. ^ "Three-year-old dies from wounds after Saudi security forces 'open fire on family'". 10 August 2017. ^ "PressTV-Saudi forces kill toddler, young man in Qatif". Press TV. 12 May 2017. ^ "Saudi Forces Raid Al-Masoura in Awamiyah, Open Fire, Destroy Houses". Al-Manar. ^ "Saudi Crown Prince Mohammed bin Salman 'has hidden away his own mother'". The Telegraph. Retrieved 15 March 2018. ^ "Timeline Saudi Arabia". Retrieved 25 June 2012. ^ Turki ibn Abdallah ruled various parts of the area between 1819 and 1824. The Second Saudi State was officially founded in 1824. ^ Abdul-Aziz ruled various parts of the area between 1902 and 1932. The Kingdom was officially founded in 1932. "Saudi Royal Family Website". House of Saud.